And, so I take my first baby steps. What have I created today? 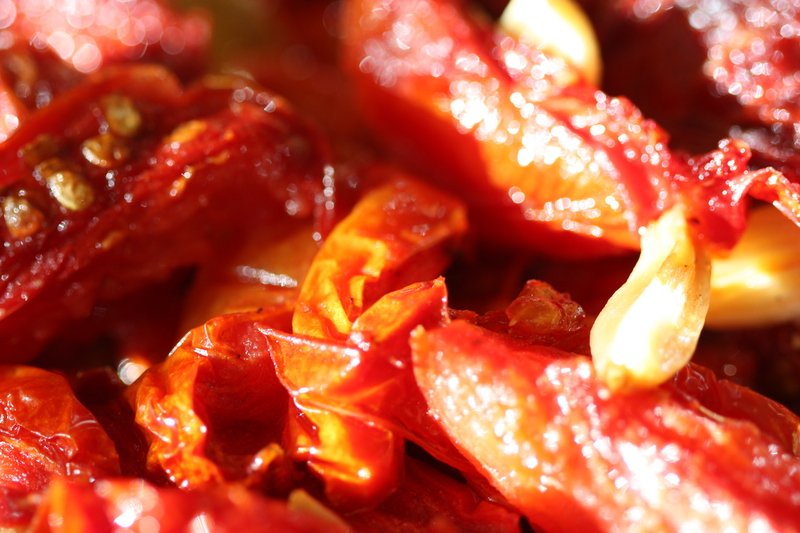 Mmm…how about some wonderful vine-ripened, oven roasted tomatoes? I’ve made them twice now and am wowed by the amazing flavour that pops in my mouth when I’m eating them. It’s fantastic what 12 hours in the oven (at the lowest temp), covered in olive oil, some garlic and pepper can do to these tomatoes. The best part–I was sleeping while this creation was taking place. The second tasty item that’s in my oven right now is some roasting garlic. Yum! I will be heading out today to Thanksgiving dinner at a friend’s place and will bring the tomatoes, the garlic and some goat cheese to enjoy on some crispy toast. Can’t wait. Pour a little olive oil onto the bottom of the pan you’ll be using. Cut tomatoes into thin-ish wedges. However many you want…just don’t overload the pan. 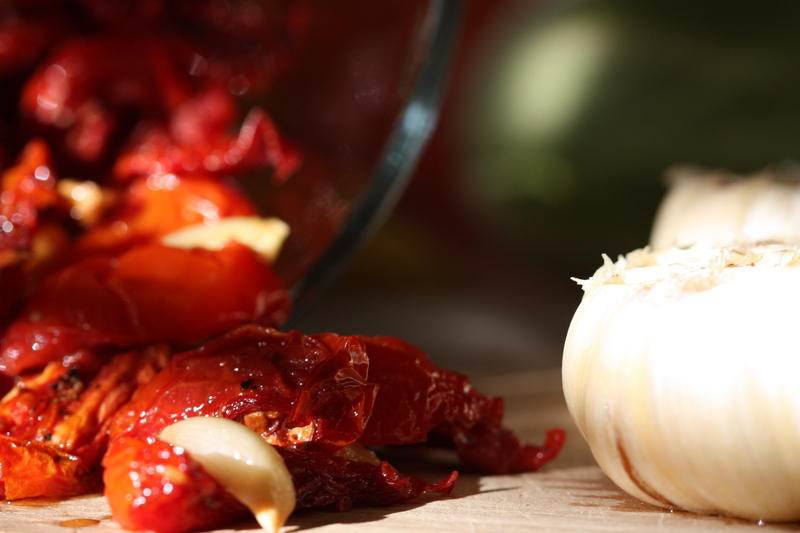 Add some roughly chopped garlic…maybe half a head. Sprinkle on the tomatoes. Grind some black pepper on top and add a bit more olive oil. 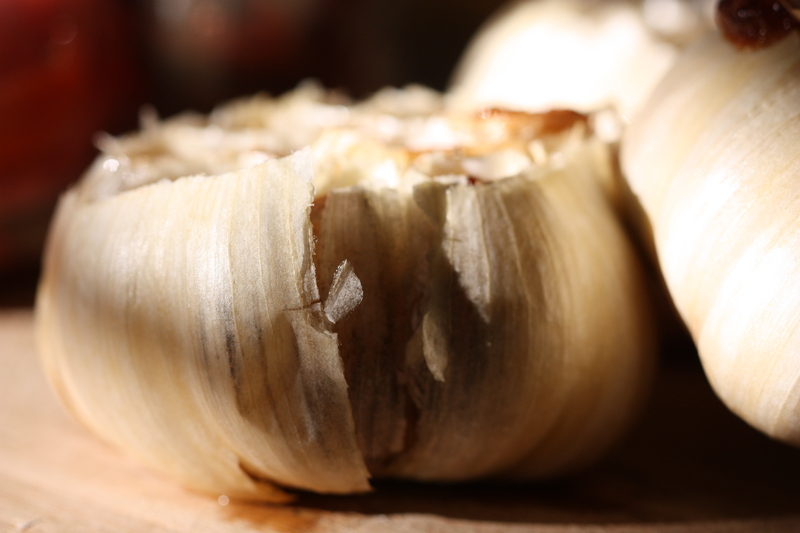 Chop the tops off your heads of garlic—just enough to expose the cloves inside. Pour a little olive oil onto each. Leave in the oven for approximately 35-45 minutes. Just check the garlic to make sure it’s turning a lovely golden colour, but not burning. You’ll notice some of the cloves pushing themselves up out of their skins. This entry was posted in Food, Thanksgiving on August 8, 2012 by Peachy.